"It's the state using its powers for the benefit of corporations to get rich." 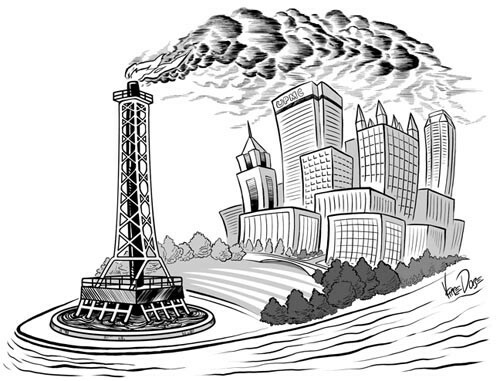 When Pittsburgh City Council voted to ban natural-gas drilling last November, the nine-member legislative body stood up to the gas industry -- and its controversial methods of gas extraction -- by exercising its local zoning authority. 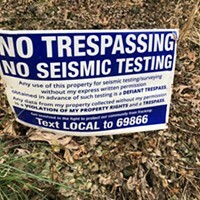 The same thing happened in Baldwin Borough in June, and in South Fayette Township last year when local officials passed restrictions on drilling in residential neighborhoods, farms and parks. But under a bill recently introduced in the state legislature, local municipalities would have to forfeit their zoning powers to the state -- at least if they plan on receiving funds generated by a natural-gas impact fee. "It's extortion," charges Pittsburgh City Councilor Doug Shields, who sponsored the city's ban. "It's the state using its powers for the benefit of corporations to get rich." In Harrisburg, state legislators have spent the past few months debating the merits of imposing a so-called "impact fee" on Marcellus shale gas-well operators. Such a fee, which Gov. Tom Corbett says he is willing to consider, would provide funds to local communities directly affected by drilling operations. Although an impact fee wasn't included in the state budget Corbett signed on June 30, the extraction-tax alternative is expected to be a top priority this fall. The concept of an impact fee is not all that controversial: Democrats, Republicans and even the gas industry are open to the idea. But one particular bill, introduced in May by Senate President Joe Scarnati (R-Jefferson), is generating fierce debate. 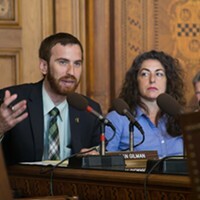 Scarnati's bill, SB-1100, would require the Pennsylvania Utility Commission to create a "model municipal ordinance" for local governments to adopt. The model ordinance would authorize oil and gas development in all zoning districts other than residential areas. It would also allow for compression stations -- which pressurize the gas so it can be pumped through pipelines -- as a permitted use in agricultural, commercial and industrial districts, and as a conditional use in residential areas. The legislation would preclude setting any limits on a well's hours of operation. Nor would it allow for "limitations on noise, light, height … or fencing on drilling operations" if those limits were more restrictive than regulations for other construction projects. Municipalities, meanwhile, would be prohibited from passing tougher zoning rules than those in the state's model. If municipalities do pass harsher rules, they can say goodbye to any proceeds from the impact fee. Scarnati's bill says the goal of these limits is to "optimize the development and use of this Commonwealth's oil and gas reserves" by applying "reasonable consistency in zoning and other municipal regulation." But some local leaders aren't happy. "A lot of local officials are taken aback that they would take away local governments' right to zone," says Deron Gabriel, a South Fayette Township commissioner. "I don't think they should dictate from Harrisburg what local communities can do." David Sanko, executive director of the Pennsylvania State Association of Township Supervisors, says he's satisfied with most of Scarnati's bill, especially the rates it sets for the impact fee. For example, the bill would impose a $40,000 flat fee for the first year of each Marcellus well's operation. That amount would be lowered by $10,000 for each of the next three years, remaining at $10,000 per year from the fourth through 10th year the well is in operation. 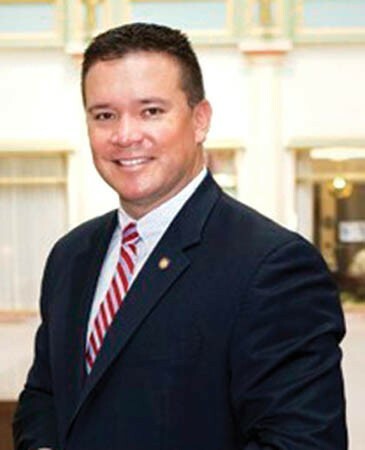 Although a co-sponsor of the bill, State Sen. John Pippy (R-Moon) says he has concerns about restricting municipalities' zoning rights. Sanko, whose organization is lobbying the legislature to pass an impact fee, says he's fine with those figures. But the legislation's "zoning part just doesn't make sense," he says, because zoning ordinances should be crafted by individual municipalities -- not by the state. "[Scarnati's] one-size-fits-all approach cannot work," agrees Mike Stelmasczyk, president of Baldwin Borough Council. "Restrictions should be customized for each municipality's needs." "[The model ordinance] would bring uniformity across the Commonwealth," says Travis Windle, spokesperson for the Marcellus Shale Coalition, a drilling advocacy group. "From a business standpoint, it's difficult for us to plan our investments when there is an ever-evolving set of rules we have to play by. We just want predictability across the board." Drew Crompton, Scarnati's chief of staff, doesn't understand why the model ordinance is generating so much criticism. "What we could have done was say that any [local] ordinance that restricts drilling would be null and void, but we didn't," he says. "[The bill] doesn't say municipalities can't pass reasonable restrictions on drilling." What it does say, Crompton stresses, is that if local municipalities severely restrict drilling operations, they should be punished. "Why should they receive a portion of an impact fee?" he asks. "They're using [the impact fee] as leverage" to keep local municipalities from enacting their own zoning ordinances, Stelmasczyk counters. "I don't think that's right." "I call it the coercion bill," adds Shields. Such criticisms have reached the ears of state legislators -- even co-sponsors of the Scarnati legislation. 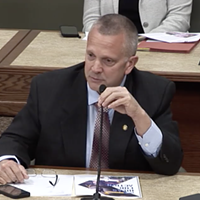 "I understand where [local officials] are coming from," says Sen. John Pippy (R-Moon), a co-sponsor of the bill. "Some of us [legislators] have concerns with the zoning portion." Pippy says it's possible that the model-ordinance provisions will be taken out of the bill. Local government officials will surely be watching to see if that happens as the bill moves through the legislature. If the model ordinance remains, some worry, local municipalities will feel pressured to avoid passing drilling bans or restrictions. Communities that have already passed such rules, meanwhile, may feel pressured to reverse their decisions. "[The bill] definitely has that effect of chilling any efforts to put local [laws] in place," says Gabriel. "It's a pretty scary proposition."